An award-winning poet, literary historian, and editor residing in Washington, DC. Author of five books of poems. Co-Editor of Beltway Poetry Quarterly, the Delaware Poetry Review, and the web exhibit DC Writers' Homes. “Mr. Whitman Goes to Washington: 4 Places from DC’s Overlooked Literary Past,” Preservation Magazine, National Trust for Historic Preservation, August 8, 2018. Author Q&A: An Interview with Kim Roberts. The poet explains her endless fascination with science. Washington Independent Review of Books, February 14, 2017. Making Art at the March for Science, The New York Times, April 23, 2017. Pine Needles poet finds inspiration from the South Pole to the St. Croix, Science Museum of Minnesota, Summer 2016. Poetry of Polar Explorations, Reverence Toward Objects in Museums, Beauty in Form and Image: An Interview with Kim Roberts, Delphi Quarterly, Summer 2015. Poets in Coffee Shops Drinking Hot Tea: A Conversation with Kim Roberts, The Best American Poetry, December 3, 2013. Intimate Conversation with Kim Roberts, Black Pearls Magazine, July 2010. A 495 Nine to Five: Five Questions for Kim Roberts, Post No Ills, August 7, 2008. An Interview with Kim Roberts, The Amistad, Howard University, Spring 2008. The Desire to Write Poetry is a Weird and Unnatural Thing: An Interview with Kim Roberts, Scene4 Magazine, September 2007. On Writers: Kim Roberts, Part 1 and Part 2, Weirding Word, June 27 and July 8, 2007. Kim is interviewed by Grace Cavalieri on the series “The Poet and the Poem from the Library of Congress,” 2018. Also, a 2011 interview with Grace and Fred Joiner; and a 2005 interview with Grace and Rose Solari, Hilary Tham, and Karren Alenier. The Kojo Nnamdi Show, How To See D.C. the Way Famous Local Writers Did, June 12, 2018. Writer’s Bone: Roberts discusses what inspired her recent poetry collection, The Scientific Method, her work for DC Writers’ Homes, and why Washington is a great city for writers, October 9, 2017. Natio nal Endowment for the Arts, Kim Roberts brings a poet’s eye to The Scientific Method, Art Works podcast, April 2017. See also: Art Talk with Kim Roberts, Art Works blog, January 31, 2012. 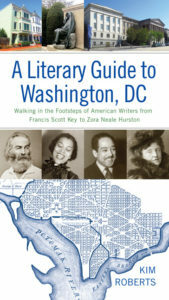 Bookend: Scoping Out the DC Literary Scene with Kim Roberts, WAMU-FM, “Metro Connection,” June 29, 2012. U Street NW and Duke Ellington: Jazz Musician, Composer, Bandleader, National Endowment for the Arts, July 8 and 15, 2010. Published by the University of Virginia Press in June 2018. With contemporary photos by Dan Vera, historic photos, and maps by Nat Case.